Owned and operated by nationally acclaimed Chef Fred Neuville and his wife Joan, Fat Hen is located in the heart of the Johns Island farming community, minutes from downtown Charleston, South Carolina. Accompanied by a grand variety of local, regional and national wines and beverages, Fat Hen serves dinner and Sunday brunch in a casual and comfortable atmosphere. Featured On: Food Network Chopped, Travel Channel Brunchnado, P Allen Smith Show, Headline News farm to Table, World Fishing Network, Low Country Live and Low Country Eats with Josh Mathers. 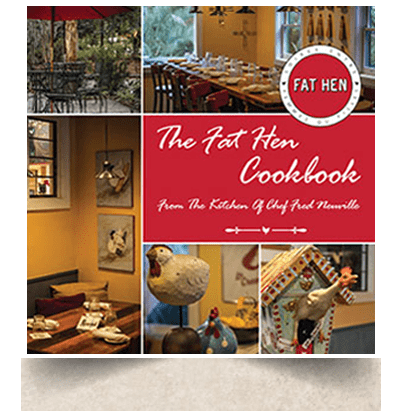 The Fat Hen Cookbook contains dozens of fully illustrated recipes from the kitchen of Chef Fred Neuville including entrées, sides, brunch, soups, salads, and more!